Hardeman Giddens (1843- 1910) led an active life that often caught the attention of citizens in Berrien County and beyond. 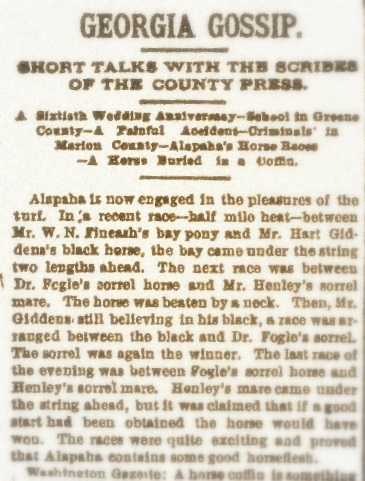 In March of 1884, the Georgia Gossip was about the horse racing at Alapaha, GA, and whether Hardeman’s black stallion was as fast as he believed. The Challengers were W.N. Fiveash, Dr. Fogle, and Mr. Henley. William Newton Fiveash, a young man of Magnolia, GA and later of Ocilla, GA entered his bay pony. Dr. James A. Fogle, a surgeon trained during the Civil War, put his sorrel horse into the race. (Fogle was the original proprietor of the Alapaha hotel later known as the Schockley Hotel) The winner for the evening was Mr. Henley’s sorrel mare. The Atlanta Constitution 25 Mar 1884, pg 2 Alapaha is now engaged in the pleasures of the turf. In a recent race — half mile heat – between Mr. W. N. Fiveash’s bay pony and Mr. Hart Gidden’s black horse, the bay came under the string two lengths ahead. The next race was between Dr. Fogles’s sorrel horse and Mr. Henley’s sorrel mare. The horse was beaten by a neck. 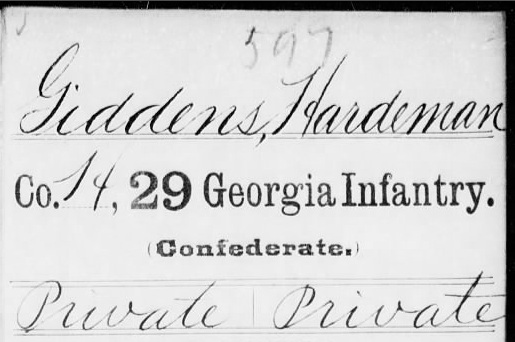 Then, Mr. Giddens still believing in his black, a race was arranged between the black and Dr. Fogle’s sorrel. The sorrel was again the winner. The last race of the evening was between Fogle’s sorrel horse and Henley’s sorrel mare. Henley’s mare came under the string ahead, but it was claimed that if a good start had been obtained the horse would have won. The races were quite exciting and proved that Alapaha contains some good horseflesh. 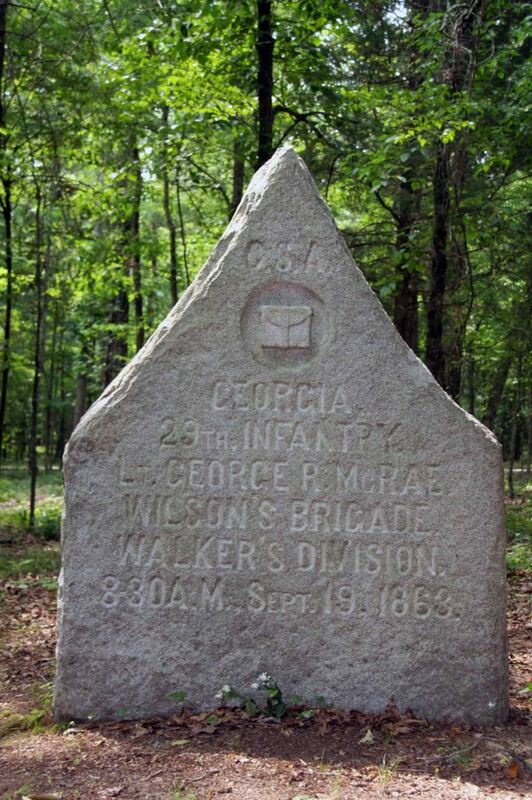 Georgia 29th Infantry, monument at Chickamauga battle field. which I am sad to say are all deseased. Thanks for reading the Ray City History Blog and sharing your family connection. You can view additional posts on Lyman F. Giddens at Lyman F. Giddens’ Barbershop and 1922 Ray City Elections.